As tacky and distasteful as its title, this 20th Century-Fox film, made in CinemaScope, has a miscast and extremely uncomfortable-looking (he was ill at the time) Humphrey Bogart posing as a priest in China in 1947, dallying with the lovely Gene Tierney and coping with warlord Lee J Cobb, complete with Hollywood oriental make-up. 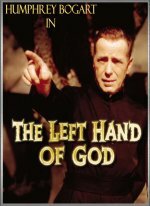 William E Barrett's original novel offered some provocative views on how a priest's mantle affects the man who wears it, but Bogart fails to convince as a tortured soul, and the screenplay simplifies the mental torment by using the garb as a device whereby Bogie can escape Cobb's clutches. Also along for the ride are Agnes Moorehead and EG Marshall. Edward Dmytryk directs tediously, as if overawed by the subject matter.